An induction loop or hearing loop is a type of Hearing Assistive Technology (HAT)/Assistive Listening Device (ALD) that works with hearing aids and cochlear implants (CIs). Hearing loops pick up the intended signal (music or speech) via a microphone and transmit the signal wirelessly. People with hearing loss switch their hearing aids or CIs to T-coil mode to receive the signal directly. 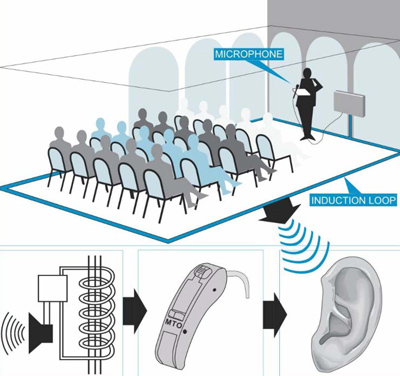 The hearing loop is a type of copper wire that encircles a room and connects to a loop (sound) amplifier, which is then routed to a microphone, TV, or PA system. When aids or CIs are set to the telecoil (T-coil) setting, the listeners enjoy a clarity that simply doesn’t exist with just their hearing instruments alone. With a certified hearing loop system installed, the loop user’s telecoil functions as an antenna, relaying sounds directly into the ear without background noise, echoes, or unwanted noise. Hearing aids amplify all sounds, even ones you don’t want to hear, like someone coughing or whispering, background noises like HVAC systems, or other ambient sounds. The loop isolates the sounds from the PA system. Loop listeners have said it’s like someone is talking inside your head. What does a looped community look like? A looped community means the places we live, work, go to school, play, shop, and seek care are accessible via the most discreet, simple hearing-assistive technology available: the induction loop. Hearing aids aren’t enough to keep people with hearing loss thoroughly engaged with their communities, though this isn’t widely known. “Particularly in situations where my clients wanted to hear their best (houses of worship, high school theaters, and large meeting rooms) the hearing aids I so carefully fit were unable to deliver,” writes Juliette Sterkens, audiologist and national loop advocate, in the May/June 2014 issue of Audiology Today. But with looping, “the result is a dramatic improvement in signal-to-noise ratio on the order of 15-25dB, an improvement that can never be obtained with hearing aids alone,” Sterkens continues. “Even the most advanced hearing aids improve SNR less than 3-5 dB in the real world.” Loops have so much impact that Sterkens encourages her fellow audiologists to foster looping in their communities, offer patients education and guidance on their T-coils, and even to loop their own offices. For more on how audiologists (and others!) 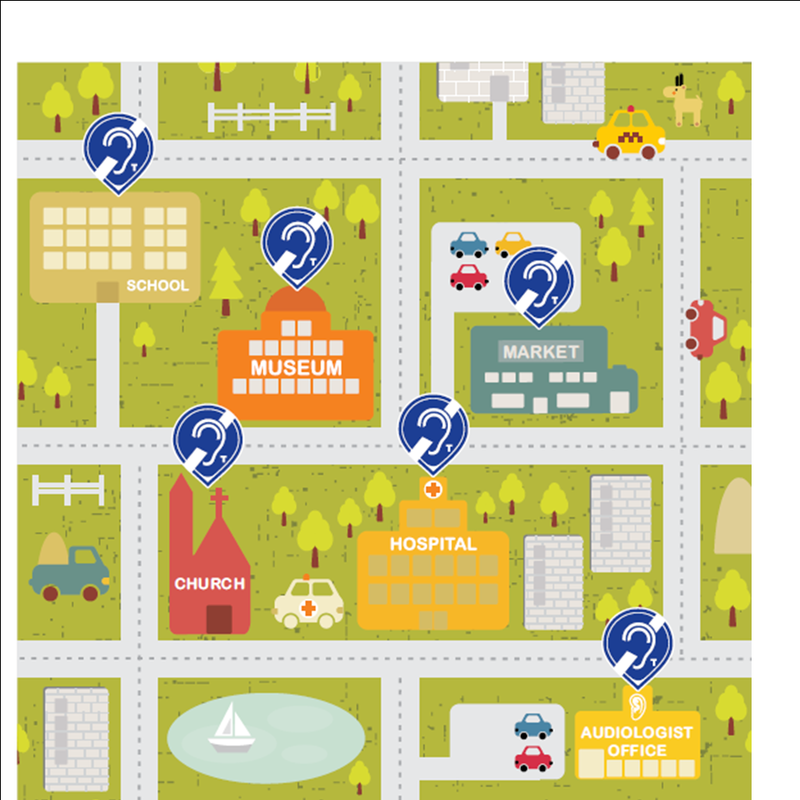 can help loop a community and for technical details, see Sterkens’ full article, courtesy of the American Academy of Audiology.